Ensuring that your swimming pool and the surrounding deck area have a clean, new-looking surface is essential to having a backyard that you will be proud of and that friends and neighbors will envy. Even if your pool is many years old, pool paint can make it look �young� again as well as help minimize damage caused by the weather and use. Pool paint can also help you prepare your home for sale. If the pool looks like it hasn�t been well-maintained, potential buyers will move on to the next house. Conversely, a pool that looks attractive and cared for is a draw for buyers, and it could even allow you to raise the asking price for your home. Don�t compromise on quality when selecting pool paint; painting your pool is not an easy job, so you don�t want to have to repeat the task in a couple of years because the pool paint is cracking or peeling. Invest in durable pool paint from a dependable brand. Choose the color of your pool paint carefully; you�ll be living with it for many years. If you are putting your house on the market, choose the most neutral shade you can find. Ask a friend for help; do-it-yourself doesn�t have to mean do-it-by-yourself. You can always return the favor by helping your friend with a home improvement project later. 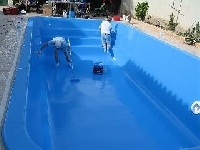 It is much better to have assistance when tackling a big job like painting your pool. Consider the surface of your pool and deck when purchasing pool paint; for example, pool paint formulated with acrylic is often recommended for sprayed or patterned concrete surfaces. Buy enough paint, and remember that many types of pool paint require two coats. You will need to measure your pool and deck surface area. The label on the pool paint will tell you how many square feet one gallon covers. The more porous the surface, the more generously you need to estimate. Determine whether or not a primer is necessary. Bare/unpainted concrete and plaster, unusually rough concrete and plaster, and fiberglass surfaces may require a primer as an undercoat for pool paint. Primer provides a �filler� between the surface and the pool paint to give the surface a more uniform profile. Some types of pool paint should only be used with a primer because the paint might not penetrate a less-porous surface or because an overly-porous surface might soak up too much paint. However, be sure not to use a primer on a surface or with a paint that does not require it; read labels carefully. Find out whether or not the primer or pool paint can be used on a wet surface. Water-based pool paint can usually be applied to a damp surface, which could help you shorten the amount of waiting time involved in painting your pool and deck. Other types of pool paint require a completely dry surface for application. Consider the paint�s other qualities. Some have a more matte appearance; others provide a bright, shiny finished look. Some are formulated to resist staining and/or algae growth. Prepare your pool as directed on the label and follow the application instructions carefully; don�t skip steps in the process to try to save time. Observe the minimum and maximum application temperatures, use quality handles and rollers, and follow all safety precautions. After you paint your pool and deck, be sure to stage it well, whether for your own gatherings with family and friends or for sale. A picnic table, pool umbrella with lounge chairs, and grill will create and inviting atmosphere and show off your newly-painted pool area to its best advantage.